This is cute and even cuter with a rat head under it. 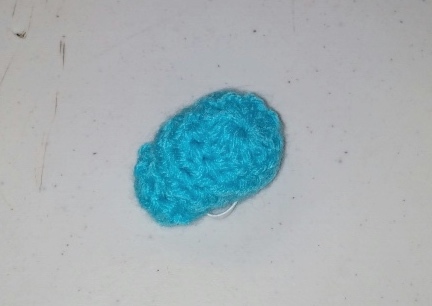 It was hand crocheted stitch by stitch in our NW SD USA non smoking home. It stays on the ratties head with elastic. The elastic is left long when it arrives to you so that you can expand or shorten it, then you can cut the ends of the elastic or tuck them to fit your own rattie. 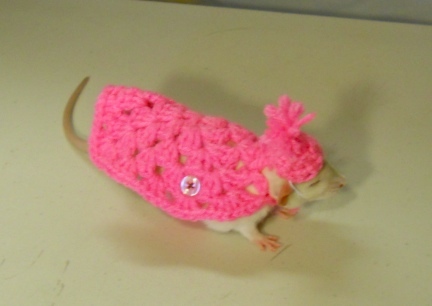 This is our Rattie, Derbe, just showing off how cute ratties look in hats and costumes and clothes! WHEN YOU BUY FROM US ALL OF THE MONEY GOES TO CARE FOR OUR ANIMALS HERE IN NW SD. MANY COULD BE CALLED 'RESCUES', BUT WE JUST CALL THEM OURS.